Pre-reno, the design team drew up their plans and contacted a local general contractor in town, Tom Trout III, whose multi-generational family-owned contracting business allowed for a seamless execution of the project. In the bathroom, Webster used the Vetrazzo Emerald Coast for their countertop that was 3 cm thickness and included two polished undermount sink cutouts for their double vanity, thanks to the craftsmanship of local fabricators, Florida Custom Marble. The coastal-inspired design was simple and straightforward, but not without a serious wow-factor in the recycled glass countertops. “I love that you can see right down into it and some of the chunks are really large, so you can see about a half-inch deep. The first thing [people] do is go over to the countertop, start touching it and go, Wow, what is this? !,” Webster said. “It’s so unique.  There’s no knock-off that can beat Vetrazzo — nothing close.” The designer also chose Waterworks for all of the bathroom fixtures in a polished nickel finish to obtain a clean, minimal look. Webster worked closely with Bennett Custom Cabinets in Jacksonville who built the high-end, custom floor-to-ceiling cabinets to make the most of the small space. On both the lower cabinets door panels beneath the Vetrazzo countertop and on the opposite wall, the designer incorporated a back-painted ocean blue tone to bring in a soft and textured look that feels effervescent and dreamlike in contrast to the grainy white oak wood cabinets. The blue and tan colors of the cabinets also enhance a very similar color palette found in the Emerald Coast countertops — creating an illusion of the colorful pieces jumping out at you like sea glass on a beach. This, Webster explains, was done to capture the soothing and natural aesthetic of sand and sea glass that the homeowners love so much. For an even bigger showstopper, the shower’s mosaic tile wall is a work of art in its own right. Webster and her team joined forces with Shirley Ford of Tile Market and the experts at Artistic Tile to create a colorful accent wall made from glass tiles in shades of green and turquoise that resemble a shimmering ocean floor. Flanked by sand-colored porcelain tile from Crossville Tiles, the neutral tones complement the shower seat that's also outfitted in Vetrazzo’s Emerald Coast. “We really wanted to create that environment as if you’re laying on the beach in a sea of sand that’s very restful, and then you have those little colorful pops — the little treasures you find on the beach and the colors of the water”, said Webster. With inspiration from deep sea treasures washed up on shore, the soothing and luminescent blue hues of the ocean, and the warmth of the sand, this sea-inspired bathroom truly brings the outside in. 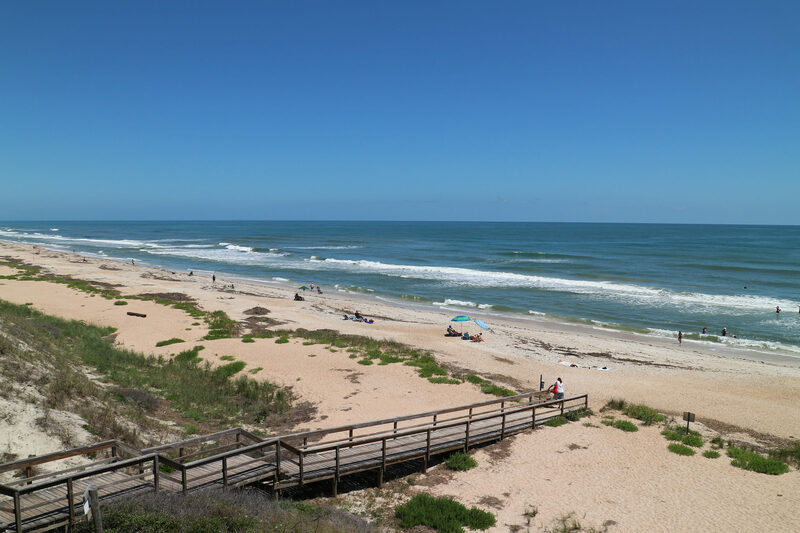 Want to create your own beachfront getaway? 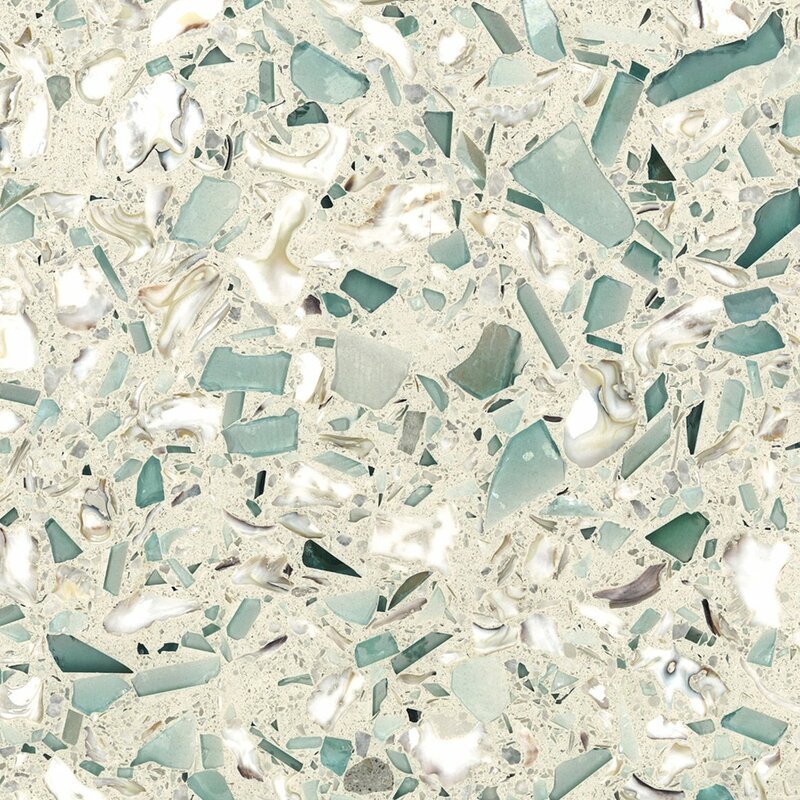 Order a sample of Vetrazzo’s Emerald Coast here.